- now there's a subject. for contemplation! "What can you show me in .nice wooden pipe racks?" .is one of the more tricky questions asked in the shop. What is there to show? Who would have thought that something apparently so simple could be such a problem? In those heady days when 75 South African cents bought 1 US Dollar, we just imported ranges from the USA, Denmark, Italy, Germany and, for real budget prices, from the Far East. We were spoilt for choice, and so were our customers. But times have changed, and our Rand now buys just a little more than 10 US cents - which doesn't buy a pipe rack anywhere. Local entrepreneurs, especially those who smoke pipes have tried to fill the gap. Some of them for the fun of it, and some to make money. Nothing seems to have really worked. It's not as simple as it seems - not just 3 or 4 pieces of wood with a few holes drilled and then stuck together. Precision equipment for routing the bowl recess is expensive and the exacting operations take time. Much handwork is involved - so for some, 100 is too many; to set up machines though, 100 may not be enough. The result is a patchy situation, often dependent on either an individual hobbyist making for "his" store, or some benevolent wholesaler subsidising the price of imported racks to satisfy his special customers. But things are looking up - a few nice looking wooden pipe racks have just arrived from the Far East. Another option has been to look at using materials other than wood - for example pottery, ceramic, plastic or leather. The best example we have seen is the glass stand for 5 pipes which we were able to buy at a very keen price - 1.7kg of glowing crystal, retailing for a remarkable R69.95. 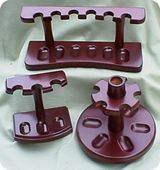 For this Christmas at least - "pipe racks?" is a less tricky question. You prefer something with little more ring size and an extra centimetre or two in length? Something pleasantly satisfying but not so much that it rules out the possibility of a more serious cigar later in the evening? Alternative Dutch choices would be La Paz Wilde Havana or Wilde Brazil, or Willem II Olinda. Having a personal liking for the Brazil leaf, I would not overlook the Handelsgold No.154. The ultimate choice at these functions would be a small handmade Cuban cigar. At present the range and quality of Demitasse size cigars is excellent - Bolivar Demitasse, Cohiba Panatelas, Montecristo Joyitas, El Rey Del Mundo Demitasse, Hoyo de Monterrey Le Hoyo du Maire will all give you 25/30 minutes of pure luxury with just enough punch to remind you that you are smoking a cigar. At this time of the year, and especially at functions such as Cocktail Parties, the words of Zino Davidoff ring true: "Smoke less, but smoke better"
Top quality ranges from top quality manufacturers - they'd be in the Gold Medals in the Comrades. A Prestige Pipe is made from well-aged briar, confirmed by the good hard grain displayed on the surface of the bowl. Degrees of close, tight Straight or Bird's Eye grains are the norm. The bowl is either flawless or only slightly specked. As these bowls are identified in the process of manufacture, they are ear-marked for special attention. Each manufacturer has his closely-guarded, secret processes to enhance the beauty and smoking qualities of these chosen pieces - fine sanding, repeated staining and polishing, deep sandblasting, treatment with heat and special oils. All these will do wonders, but they take time and great skill, and are very costly. A Prestige Pipe may undergo as many as 30 finishing operations and can take over 2 months to complete. As we go up the price and quality scale in our Prestige Pipe Collection (which is constantly changing), you may notice that the manufacturer has added something to the pipe to make it even more attractive. A better, more complicated finish enhancing the grain, a better quality mouthpiece for both appearance and comfort in the mouth, a little decoration or insignia in brass or sterling silver in recognition of its quality. The demand for Prestige Pipes is testimony to the fact that they are appreciated for their rarity, beauty of the grain and smoking quality. They are always in short supply - testing the integrity of the manufacturer, but a top quality manufacturer will not lower his standards. You can treat yourself to a Prestige Pipe at 25% off the normal retail price during the promotion from December 6 to December 19, 2001. Maybe drop a hint for Christmas? I am often asked to suggest a cigar - either as a gift or for a personal smoke. Normally I suggest a cigar the size of a Petit Corona, a Corona or my favourite, a Robusto. But this time of the year is not normal, it is the season when one most often has the time to appreciate the quality of a larger cigar - the "Churchill". This could also be described as the reflective season - a time to sit back and relax, reflecting on the past year and planning optimistically for the next year. The ideal time to enjoy the company of a truly superb cigar - the Churchill. Its sheer size is enough to impress and excite you. As you cut and light the Churchill, you begin to anticipate the pleasure that is going to be yours for the next 90 to 120 minutes; the pleasure of smoking it, savouring the development of the taste from beautifully mild for the first quarter, to the full-bodied flavour of the third quarter; then putting it to rest and watching the last wisps of smoke rise and fade away into nothing save the faint aroma of the world's most affordable luxury - a great cigar. The three cigars are presented in glass tubes in a sleeve - perfectly humidified, just don't let them get warm. Contact your nearest Wesley's and ask them to reserve some packs for you and your friends. We all like a little sunshine and warmth, but too much is not good for us. Neither is it good for your cigars. The dangers are the growth of mould on the wrapper or the hatching of the dreaded tobacco beetle (both of which result from excessive warmth and humidity) or the other extreme - dehydration. Stay cool! And keep your cigars cool too. The first watchpoint is to try to avoid situations where your cigars may be exposed to temperatures above 22°C for any period of time - don't forget them on the table after lunch. Think about the temperature when you take your cigars to the beach or leave them in the cubby-hole or boot. Can they fit in the cool box? Watch the humidity - try to maintain the normal humidity they are used to (read "What do I need to do to keep my cigars in good condition?" - www.wesleys.co.za/archives2.htm#archive5 ). When you're away from home, keep the cigars (boxed or loose) in a sealed container or zip seal packet; moisten if necessary or put in a packet of silica gel for excess humidity leading to extreme cases of wetness. We are in the "Mould" season - high temperatures combined with excess humidity can be a disaster. But don't confuse "Bloom" (or "Plume") with "Mould". "The more I travel, the more I write, and the more I learn, the more I am amazed at some of the fanciful inaccuracies I keep encountering. Often they challenge the imagination and leave me in awe. Perhaps, years ago, someone was drinking too much rum under the hot Cuban sun. That would certainly account for a belief that links bloom or mold to the Cuban spring. The seasons, whether in Cuba or elsewhere, have nothing to do with either (other than the fact that spring rains cause humidity which, in turn, contributes to mold). As discussed in the latest edition of my book, The Ultimate Cigar Book, bloom (or plume) refers to the small, powdery white spots they occasionally appear on cigar wrappers as the cigars are aged. Easily brushed off with the finger, bloom does not affect the taste and rather, is indicative of a well-cured and especially oily wrapper that is aging gracefully. Mold, on the other hand, is devastating to find on a cigar. This blue-green fuzz is caused by too much moisture and heat, and/or by impurities in the humidifying water or in the humidor itself. Mold will taint a cigar's wrapper and more importantly, its taste, giving it an unpleasant and sour mustiness. Moldy cigars should be discarded (unless you like sucking up spores with each puff of smoke), to prevent this contamination from spreading to the rest of the sticks in the box." "By the way I have an article on other Cigar Myths appearing in the November 2001 issue of Robb Report (phone (1) 978 795 3000 in Acton, Massachusetts, USA; www.robbreport.com), a luxury lifestyle magazine for which I am the spirit and cigar editor." Richard Carleton Hacker has written more than 11 books on pipe and cigar smoking and is one of the world's best-known authors and authorities on the subject. First of all, my thanks to all of you for your kind comments on our website and for your support during 2001. It wouldn't be the same without you. We won't be long into 2002 before the effect of our weakened Rand will be reflected in higher prices for all the imported cigars, pipes and accessories. We have already had substantially increased Zippo prices and are expecting new pricelists from our three major suppliers of cigars and tobaccos. Obviously stock already in the shops is at current prices but new stock will be arriving from January 2002. The anti-smoking lobbyists are already howling for more stringent penalties for individuals and establishments that transgress the law, and no doubt the "sin tax" on tobacco products won't be overlooked in the next budget. But all is not gloom and doom - none of this is really new to us, so with some discretion and tolerance we should all be able to continue to enjoy our smoking pleasure. On our part we'll be searching for quality products - pipes, cigars and accessories - at the best possible prices. Some of the names may be new to you, but try them; sentimental attachment to a particular brand may have to become a thing of the past. We have great value pipes in the offing. In addition we'll continue to negotiate with our suppliers, both local and overseas, for products to offer on our "Fortnightly Features" which we trust will give you an opportunity to reduce the overall cost of your smoking pleasure. The current Feature is a return to the past - in cigars and price. Agio Gouden Oogst - at a price it is difficult to believe. Your nearest Wesley's has a partly-unravelled cigar to show you the quality of the actual wrapper leaf under the golden painted exterior. Those who have smoked these cigars have discovered this quality for themselves. Machine-made cigars are not confined to mass market cigars - we'll be talking next month about machine made cigars from Cuba, comparing them with handmade, and with machine-bunched hand finished, Cuban cigars. The machine-bunched in particular offer very pleasant smoking on casual occasions, and really good value. Pipe prices in 2002 will not be immune to the effect of the weak rand. Prolong the life of your favourite briar with a little more care and attention. Take a look at those old discarded pipes (discoloured, sour, damaged) - some of them may now easily justify the cost of a professional repair or refurbishment. The bowl will be reamed, cleaned and sweetened with "mead", and the whole pipe polished to restore its dignified appearance - only the dents will remain as a reminder of past pleasures. As well as replacement mouthpieces, a hole in the bowl or a cracked shank can be repaired. You won't be able to buy a new branded pipe for the R100 to R150 the professional job may cost you. Bring in your pipe for assessment. A discoloured or sour pipe will respond to home treatment. 1. Ream the carbon layer to a thickness of about 1.5mm (2c piece) - the T-shaped reamer from Savinelli or the precise, high-tech Senior reamer will do the job comfortably. 2. Use a bristle cleaner dipped in a solvent (eg Savinelli Pipe Clean, or some form of alcohol) to really scrub the inside of the shank and mouthpiece - be careful not to start a hole in the bowl through excessive twisting. (For very bent pipes go easy round the bend in the mouthpiece.) You have finished when the pipe cleaner comes through clean. 3. Remove the oxidation from the mouthpiece with a mild abrasive (eg Savinelli Stem Polish or Jeweller's rouge). This might require vigorous and lengthy rubbing (a whole TV programme); a buffing wheel is a big help. Next week we offer the Savinelli Con-Dit-Kit (Pipe Clean, Bowl & Stem polishes) at a very special price. Do rotate your pipes to allow each to dry out properly. 2. Do polish the mouthpiece regularly, don't let the oxidation get the upper hand. 3. Do allow the carbon layer to build in your new pipe - right to the bottom of the bowl - and then keep it reamed to about 1.5mm thickness to prevent cracking. 4. If yours is a filter pipe - do use the filter or use the adapter. Don't smoke without one of them, even once, it can lead to an ill-fitting mouthpiece through a swollen shank. This is almost impossible to rectify. 5. To prevent breakage, do hold close to the join when removing the mouthpiece from the bowl, and don't remove the mouthpiece until the pipe is cool. 6. Don't use a sharp pointed instrument to clean out the bowl - you may drill a hole in the bottom. 7. Do hold your pipe by the bowl (not the stem) when "tapping out" the ash; and don't knock it against a hard surface - you may break the shank or mouthpiece or crack the bowl. Fit a "cork knocker" to a handy ashtray. 8. If yours is a "Turbo" lighter be very careful where you aim the flame - don't burn inside of the bowl. The general principle to bear in mind is that the cleaner and drier you keep your pipe, the more enjoyable it will be to smoke - and the longer it will continue to give pleasure. PS For Valentine’s Day we offer a Romeo y Julieta de luxe No.3 at a special price – a delightful hand rolled Cuban Half Corona, with very romantic associations.